Oh, hey- big surprise here. I’m posting another recipe from my favorite bread book, Artisan Bread in Five Minutes a Day. I promise I am not gaining anything by repeatedly putting in plugs for this book. Everything I have made has been delicious and surprisingly easy to make (no-kneading!). It’s going to take a lot for me to stray from the methods in the is book. I made this for Monday night dinner after I got home from work. I had about 2 ounces of energy left while I was making it, so I was happy to find how quickly and deliciously it came together. My brother-in-law, Kenny, gave it his seal of approval as well and he liked it well enough to accept me forcing the leftovers home with him. This is a highly adapted recipe and I will definitely be making it again soon. Perhaps with parmesan, caramelized onions, basil, or tomatoes. The list goes on and on. 1. Mix the yeast, salt, sugar, and olive oil with water in a 5 quart container or bowl. 2. Mix in the flour without kneading, using a wooden spoon until just combined. 3. Cover the dough (not airtight) and allow to rest at room temperature until dough rises and then collapses, about 2 hours. 4. Twenty minutes before baking, preheat the oven to 425 degrees. Grease a cookie sheet and set aside. 5. Grab a 1lb, grapefruit-sized hunk of dough and dust liberally with flour. Flatten into a 1/2-3/4 inch thick oblong shape with your hands or a rolling pin. 6. Sprinkle with rosemary, coarse salt, and black pepper. Lightly drizzle olive oil over the surface of the dough. 7. Allow the focaccia to rest and rise for 10-20 minutes. 8. After the dough has rested, place the dough in the oven and bake for about 25 minutes, or until the crust is lightly browned. 9. Cut into wedges and serve warm. 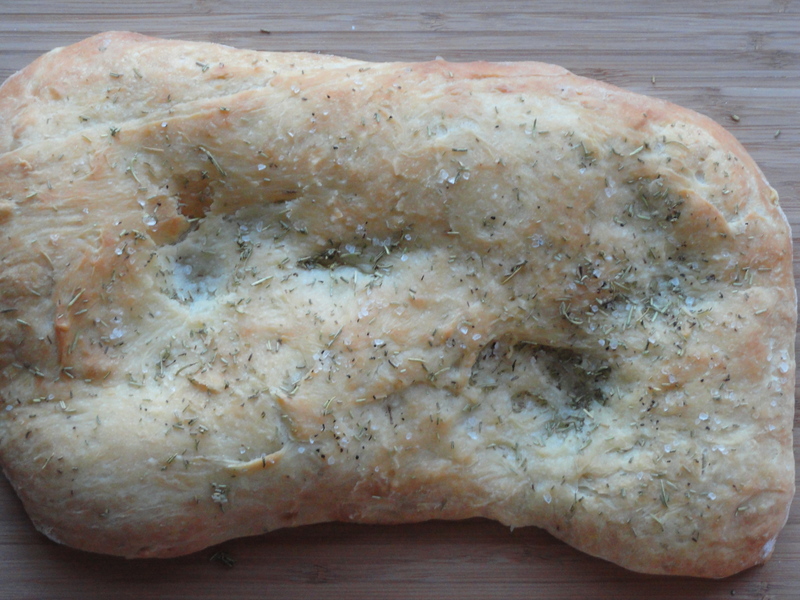 I think I could live on focaccia bread, one of my favorites. This look delicious and the recipe is fairly easy-I could not ask for more. I will need to try this recipe, I have seen rave reviews on that cookbook so I am sure I will be happy with the results. Inspiring post and thanks for sharing! I bought that book for my boyfriend when he mentioned an interest in breadbaking, but alas, I don’t think he’s even opened it. I had been hoping for leftovers, but I think it’s time to commandeer the book instead. Maria, you definitely need to give the recipes in the book a try. You will love it! Can’t wait to try it! 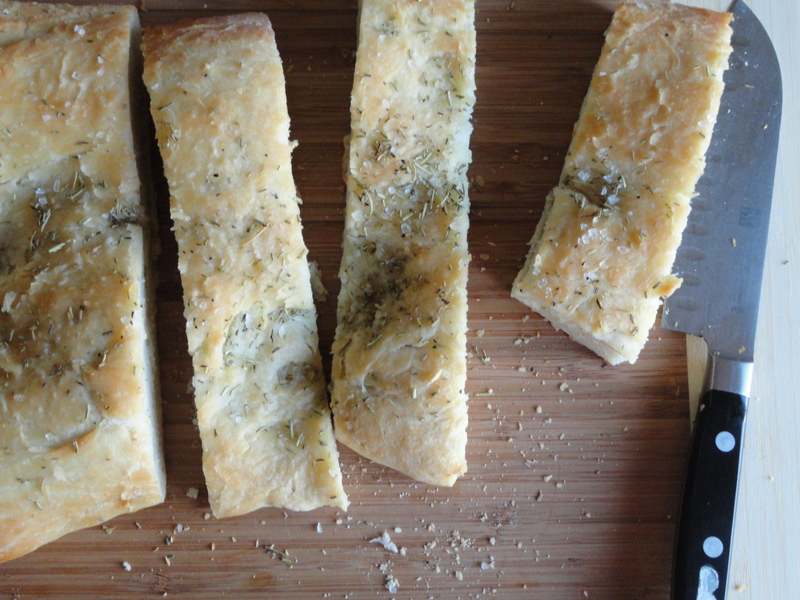 I made another rosemary foccacia recipe this week and it was an epic fail. It even had carmelized onions and fresh rosemary from our greenhouse. Try, try again! I hate those epic fails. I have had many of them. Hope you like the recipe! you make it sound so easy…..i think i will be visiting in early may with yo mama…hope you’re free!!! !